Suggestions, tips and enquiries to my email address, on the main page. This is a utility to download saves from and upload saves to GBA cartridges. It requires Xboo Communicator (XComms) for the file server, and an Xboo cable. Instructions on how to build the cable are supplied in the XComms package. Also, it is a good idea to test your saves for errors, as the error checking in this utility is not guaranteed. You can download a whole heap of game saves from N-Scene, to help you get that little bit further. Install Xboo Communicator by extracting all the files in the zip file to a directory. Copy UserPort.sys to %WINDIR%\SYSTEM32\DRIVERS, where %WINDIR% is the directory windows was installed into. Run UserPort.exe, click Defaults, then click Start, then click Exit. Test xcomms.exe by running it, then click the GBA icon and select SendSave_mb.gba, without the GBA connected. If "No response from GBA" appears, then the driver has been installed successfully. If not, then read UserPort.pdf for further information. Insert the cartridge into the GBA while it is off. Connect the GBA to the computer using the Xboo cable. Turn on the GBA while holding down Start + Select so the Nintendo logo disappears. Press L+A+B on the GBA or press R on the PC. Wait until it says "Okay to turn off GBA". If any of the text was corrupted, then go back to step 4. Rename GBA_Cart.sav to %name of game%.sav, where %name of game% is the name of the ROM image of the game. Copy it to your VisualBoy Advance save directory. Using VisualBoy Advance, open the ROM image for the game. Try to load your save game. If it works then congratulations you have just successfully downloaded the save. If not, go back to step 4. Rename %name of game%.sav to GBA_Cart.sav, where %name of game% is the name of the ROM image of the game. Press R+A+B on the GBA or press W on the PC. If any of the text was corrupted, then go back to step 6. Turn on your GBA normally. If it works then congratulations you have just successfully uploaded the save. If not, go back to step 6. This is a GBA program designed for use with a DLDI compatible cart. It allows you to backup game saves from your original cartridges onto a flash memory card. You can then copy them to your computer and restore them at a later date. To use it, put the file onto your compact flash card and run it using the Game option in your cart's menu. It will then tell you what to do next. 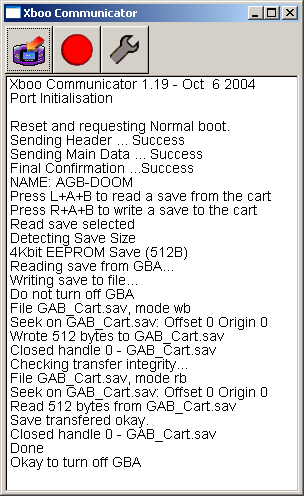 This is a version of SendSave modified by ps2aich for MBV2 cables. I have not personally tested it and offer no guarantees, although I have heard that it works. PC side save files will have an extra 7 byte header, which needs to be removed to use the save in an emulator or through other cables. Instructions are included in the archive. akkera102 has written a GBA multiboot loader for the Raspberry Pi. It incorporates SendSave and does not need a PC to operate. Raspberry Pi GBA Loader is available on GitHub.